GOKPOP | Exclusive K-News in Malaysia & Singapore: A Date with Kim Rae Won on 10 October! A Date with Kim Rae Won on 10 October! 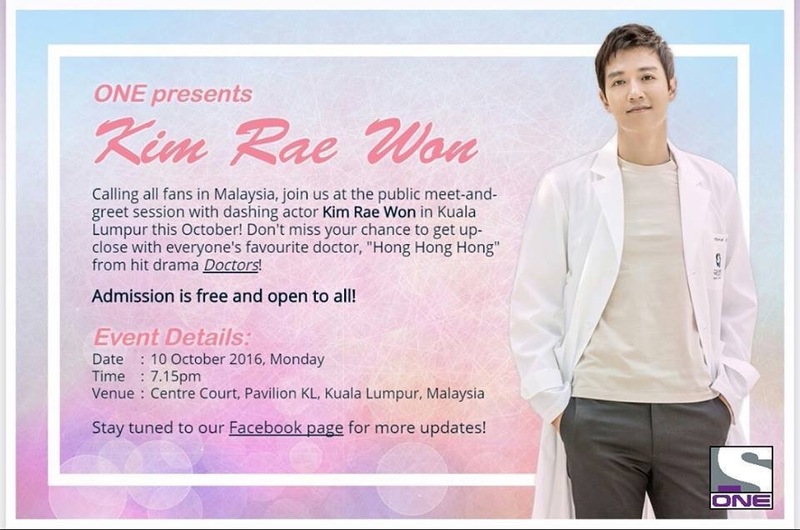 KUALA LUMPUR, 3 October 2016 – Fresh off the success of the recently concluded hit drama Doctors, dashing actor Kim Rae Won will be in Kuala Lumpur to meet with fans on Monday, 10 October 2016, 7.15pm at Centre Court, Pavilion KL, Kuala Lumpur. The open-to-public meet-and-greet session is organized by number one Korean entertainment channel ONE. With a warm smile and gentle personality, it is no wonder that Kim Rae Won has mainly played the romantic hero for his roles on television. Known for his solid acting chops and his incredible on-screen presence, the 35-year-old actor has been a part of many productions and has won numerous accolades since his debut in 1997, including Actor of the Year at the SBS Drama Awards in 2015 and the Excellence Award, Actor at the Korea Drama Awards in 2008. Throughout his illustrious career, Kim Rae Won has taken on both classical romantic hero roles as well as unflinching portrayals of grittier characters. His memorable works include romance drama Love Story in Harvard; legal thriller Punch; and, most recently, Doctors, the highly rated drama which also stars Park Shin Hye. For more information on ‘A Date with Kim Rae Won’, visit www.ONEtvasia.com/KimRaeWon, or stay tuned to www.facebook.com/ONEtvasia for the latest updates. Join in the conversation on social media using the official hashtag #ONEKimRaeWon. Due to a traumatic childhood, Hye Jung (Park Shin Hye) has grown up to become a tough-as-nails ruffian who is completely untrusting of others. When she is sent to live with her grandmother, she meets neurosurgeon-turned-teacher Hong Ji Hong, who ends up taking her under his wing and becoming her mentor. Under his care and guidance, can she put her past behind her and become an accomplished neurosurgeon too? ONE is available in Malaysia through Astro Ch 393.